It's like a wireless phone contract, but for a console. I seem to recall big words coming down from Microsoft a few decades ago about how they wanted a Windows machine in every living room, not just in your office. That promise never really materialized, that is, until you realize the Xbox 360 is outselling all consoles worldwide and most people use the console to stream movies and TV just as much, if not more, than they use it to play games. Microsoft has decided to capitalize on the trend of streaming content to make it even easier to get an Xbox 360 in your home. In two weeks, you will be able to buy an Xbox sporting a 4gb HD bundled with Kinect for $99, as long as you agree to a two year contract and a $15 monthly fee. 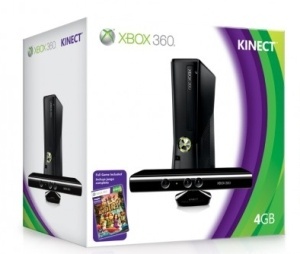 That's right, you get a heavily discounted 360 with Kinect, and the majority of the cost spread out over two years. But you get your money's worth, according to Microsoft, with the monthly subscription including an Xbox Live Gold membership, a warranty, and possible access to extra streaming content from content providers and sports networks. Of course, there would be a penalty for bagging out of the two-year contract early, similar to how wireless cell phone contracts work now. Adding up the costs of purchasing these items individually, and it seems like a zero sum proposition. A new bundle package would cost you around $300, and a two-year XBox Live Gold sub would set you back $100; the total cost being $400, whereas this new deal would set you back $459 ($99 bundle + $15 X 24 months). If you consider the convenience of getting an Xbox for a Benjamin and the promise of additional content worth $59, then this new bundle might be up your alley. You know, if you don't have an Xbox already. Of course, you have to factor in the cost of games, and a beefier hard drive once that paltry 4 gig jobber fills up. Yeah, maybe this isn't such a good idea for a gamer. But it makes great sense if you are looking for a cheap alternative to a Roku or Apple TV.